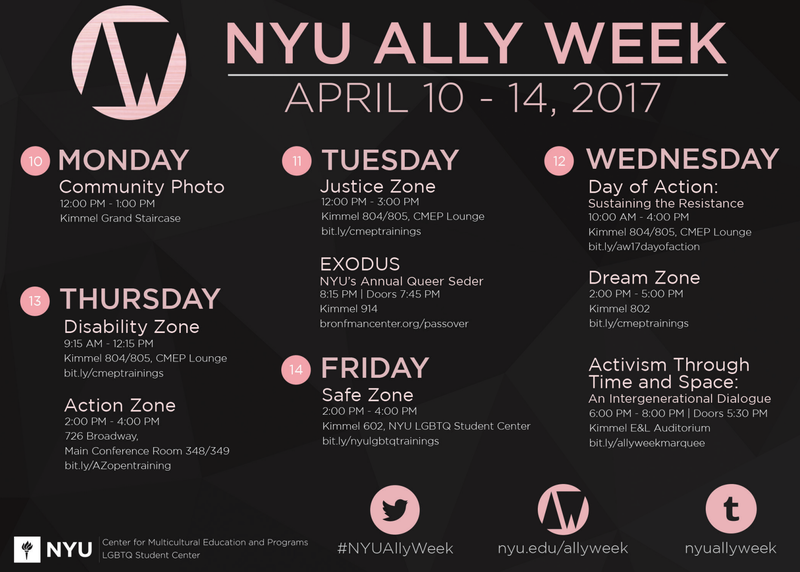 Visit bit.ly/allyweek17events for Ally Week 2017 events all around NYU! RSVP here to attend Conversations of Color: Diversity and Inclusion Discussion. NYU Steinhardt continues to make strides in our devotion to diversity and inclusion in our community. Join Charlton McIlwain, Associate Dean for Faculty Development and Diversity, for an open discussion on what Steinhardt and the greater NYU community are doing to increase awareness related to diversity and inclusion and how you can participate. At Conversations of Color, Steinhardt students, faculty, and administrators discuss race, ethnicity, culture, sexual orientation, religious or spiritual belief, ability, gender identity/expression, economic class, and other related topics of diversity. Sponsored by the Steinhardt Office of Student Affair. DATA VISUALIZATION CLINIC: Come to this discussion-based session to learn about best practices, tips, and inspirations for creating versatile visualizations. If you are currently working with data and have begun working through your visualizations, bring your graphics to the workshop to showcase your skills or get feedback. CULTURE MAPPING @ NYU: Interested in applying digital tools to the interpretation and visualization of cultures, geographies, and urban experience? Learn about project-based scholarship with fellow-travelers in pedagogy, cartography, data-wrangling, and interactive storytelling. Co-sponsored with the College of Arts & Science and New York Scapes. New York University Students: You’re invited to a College Class Ring ordering event! Special Discounts: $100 off 14 Karat White & Yellow Gold $150 off 18 Karat White & Yellow Gold. Inquire about our interest free payment plans. Herff Jones takes pride in creating college graduation rings for students and graduates of NYU. Reward yourself with a symbol of excellence by selecting the college ring which suits your style, experience and achievement. Also, don’t forget to order your Cap & Gown by April 11th. Click on the link below. Faith Zone is an award-winning training workshop designed to promote spiritual and religious literacy and dialogue. NYU students, faculty, and staff members can participate this training to become Faith Zone certified. Breakfast will be served. Faith Zone Trainings (FZT) are a resource for students, faculty and staff on campus who desire innovative and participatory training, contextualized resources, and honest dialogue about religion & spirituality. Based upon the Safe Zone model which is used to educate groups about the LGBTQ community, these FZT sessions take a dual approach that integrates theory and practice. In doing so, FZT engages participants in activities which will increase religious literacy and offer practical tools for learning about religion and spirituality.Topics covered include reflecting on personal experiences with faith and spirituality, examining the global and local context for various religious traditions represented at NYU, as well as discussing tips for creating a safe and welcoming environment in one’s office, residence hall, student group or classroom. Participants will receive a certificate of completion and placard to display verifying the completion of the training.